Good afternoon graduating seniors, parents, President Bridges, faculty, staff, and guests; it is my honor today to address this distinguished group. When President Bridges called me to ask that I speak at Baccalaureate, I posed the question to myself, “what do I have to say that would be relevant to the occasion?” Hopefully, you will find germane the reflection of my time at Whitman. When I walked into the Office of Financial Aid Services 29 years ago, I had no idea that I had found my life’s work. What began as just another job became a career; one that has brought me great joy, satisfaction, and fulfillment, along with moments of frustration and disappointment. My first job at Whitman was to fill out a sheet of information on every student who received need-based aid, for the Higher Education Coordinating Board — our state student aid agency. It took over a ream of paper and two weeks to complete the task. Now I run a program that takes seconds and creates a report, which I then upload to the HEC Board Web site! You need to understand that in 1980, we had no computers on our desks. Some of the luckier offices (admission and registrar) had “dumb” terminals, which we would beg to use every couple of weeks to input data. To print letters for student awards, I would sit in the basement of Memorial, in front of an electric typewriter that was connected to the main computer in Maxey via a phone line, and feed paper into the machine for each letter. It would take about 2½ minutes per page, so I would bring a book and read while the typewriter was doing its thing! To run letters just for incoming students took a whole day, and returning students took twice that long. Good thing I like to read! Today we run letters for only new students, and it takes us about half an hour to print two copies of double-sided letters for approximately 500 students. For returning students we’ve moved into the current century, and post them on the Web for students to review and accept. Twenty-nine years ago we had never heard of Microsoft or Apple. IBM made computers that were the size of a room, and there were few programs available for end users. There was no Excel, Word, Power Point, Datatel, or e-mail! Word processing was unheard of; we did everything on a typewriter — you do know what typewriters are don’t you? — and were thrilled when IBM came out with the Selectric, which had a correction tape on the machine! And, if we needed more than one copy of the document or letter, we had to use carbon paper. In 1980 there was no Internet, no fiber optic cable, no computer labs, no cell phones or iPods. There were no social networks like Facebook, MySpace, and Twitter. We communicated by writing letters and dialing a phone that was attached somewhere to a wall. The library (about half its current size) and health center (which sat to the south of the creek behind Reid Campus Center) were not open 24/7, the baseball field was on Ankeny, and Whitman did not own the fields off Sumach; they were the City’s adult softball fields. There was no Reid Campus Center, and Pete Reid — for whom the center is named and who is retiring again from the college — was Treasurer of Whitman. Where RCC now stands was White Temple Baptist Church, and behind that on Park were old homes, which had been made into apartments that mostly housed Whitman students. The Student Center sat to the west of Reid (where the current parking lot is) and had been a furniture store in a previous life. The Hall of Music was in Hunter Conservatory, where the one student who was majoring in music studied. And of course, there was no Baker Ferguson Fitness Center, only Sherwood, where sheets of fiberglass hung in the halls and locker rooms to drain the water that leaked through the courtyard area. (Very attractive I might add!) Boyer House, in which faculty offices, the campus print shop and campus mailing services reside, was a mortuary, and where the west wing of Olin now sits was an old residence hall that had been turned into faculty offices. Since I began at Whitman, financial aid programs have been created, gone the way of the dodo and had name changes. Pell Grants used to be Basic Educational Opportunity Grants, Perkins Loans were National Direct Student Loans and Stafford Loans were Guaranteed Student Loans. There were no Academic Competitiveness Grants or SMART Grants, nor were there any private student loans. Federal and state student aid program regulations have increased exponentially, and I have truly learned that the only constant in financial aid is change! As the earth revolves around the sun and each day moves into the next, life’s rhythm evolves. Much has changed at Whitman and in my life in the past 29 years. When I started working here on July 1, 1980, my children were 5 and 7; my son was starting kindergarten in the fall, and my daughter was beginning second grade. Both are now grown with children of their own. My daughter is a stay-at-home mom to her two little girls, and my son is the director of marketing for athletics at WSU. He and his wife have a 20-month-old son. Much will change for you as well, in the next 29 years. Hopefully, you have gained the tools during your time at Whitman to allow you to adapt to change and to learn how to use all of the new programs and gadgets that will be available to you during your lifetime. The vistas that you cannot see or imagine now will offer you amazing views in the coming years. Drink in those views and embrace the changes life brings you. It has been my great good fortune to work in this amazing place for 29 years. In that time I think (I hope) that I’ve been able to make a positive difference in many students’ lives. I’ve worked with some remarkable people — students, faculty, and staff — and made many good friends. I’ve had the opportunity to meet many wonderful individuals both in and out of the education field, and to see parts of this country I might not otherwise have seen; I feel truly blessed to have experienced all of it. My wish for each of you is that you too, find something you are passionate about and that you are able to get as much enjoyment and satisfaction out of your work as I have during my time at Whitman. In Ecclesiastes 3:1 we read, “To everything there is a season, and a time to every purpose under heaven.” “My season” and, hopefully, “my purpose,” at Whitman College have been completed. As of June 30th, I will be retiring and moving into a new chapter in my life. 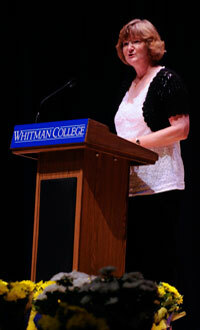 I can only hope that it is as invigorating, enriching, and rewarding as my time at Whitman has been. Good luck and God bless all of you.